Thanks for stopping by and sharing. Be sure to view it in Full HD – 1080p for the most detail. 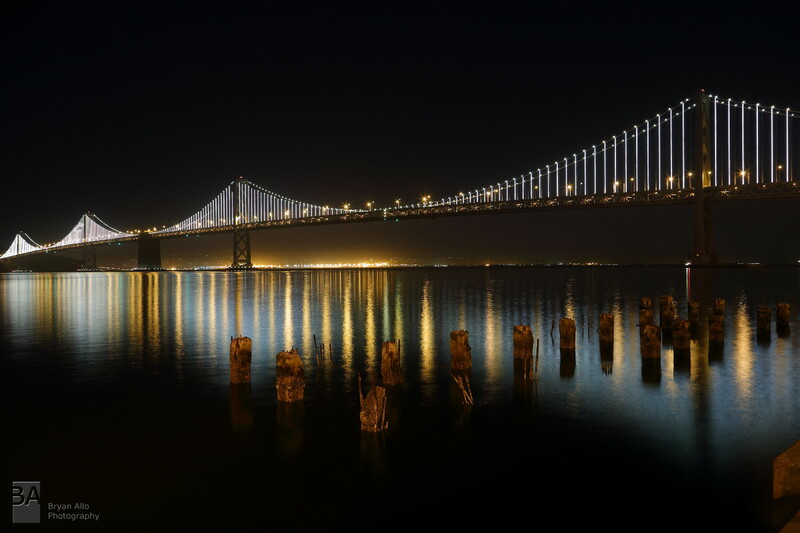 Yesterday was another lovely day chasing sunsets and the Bay Bridge lights. I decided to seize the opportunity presented by ideal photography weather conditions in the Bay Area. Most ideal was the low (sometimes none) wind speed. This means very calm bay waters, relatively speaking, which in turn means an opportunity for a dramatic light show through sunset and through the night. My strategy started out with the port of Oakland. From a google maps survey of the area, most of it looked restricted so I looked for a backup vantage point and settled on Potrero Hill which may warrant my next photo excursion to SF. I was unsure about how much access I would have to a coveted view of the bay. 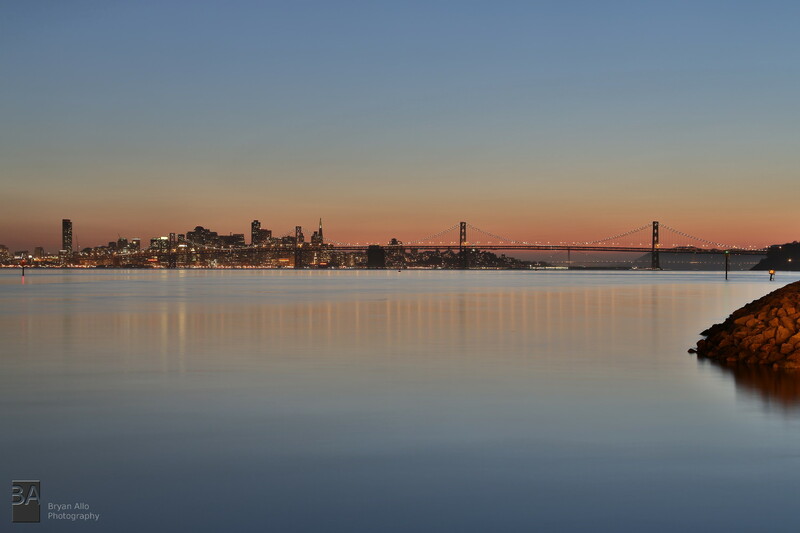 I definitely wanted to at elast have some shots from the Oakland side of the bay, especially during sunset. I arrived at the port by mid afternoon and began to scout the area. Portview Park was my ideal view but it was slightly obstructed by the restricted docks area – I wish I had a way of gaining access to the port docks. That in and of itself would make for not only an ideal perspective but may prove to be a treasure trove of industrial and gritty photography goodness. I moved on to Middle Harbor Shoreline Park where I found an outcrop nature preserve with trail access. The view was a bit too distant and less than ideal but then again if I’ve learned anything, it’s that nothing ever is. With my location sorted out I proceeded to wolf down a Subway sandwich while waiting for the sunset. I parked next to a really nice, clean Nissan 300ZX. Being a car enthusiast myself I began to talk cars with Allan the owner. I drove down in my roadster so it was all around cartalk. Allan was very laid back, easygoing and ended up just handing out through the sunset into the evening. Very nice guy. While I was setting up and shooting another great gentleman showed up. He was a port customs agent who just happened to carry his Digital Rebel everywhere he went. He had just got off work and decided to come take in the view as well so we all hung out and talked everything from cars to logistics to photography while shooting the sunset. It made for a great evening and great new friends. I took a 2 hour time lapse of this scene with the 7D + 17-55mm f/2.8 while shooting stills such as the one above with the 5D Mark III + 24-105mm f/4. It will take a while to process all the time lapse frames and will present that compilation in a separate post. Unfortunately the Bay Bridge lights were not visible from this vantage point. It turns out the lights are angled slightly towards the city of San Francisco. I later found out this was for the simple reason to avoid interfering with drivers’ view coming into the city. Finally after dark we all packed up and left. I headed over into SF to do another time lapse from the peer 14 perspective. There I met more interesting folks. First was a cool guy named Brian visiting from Chicago. He’s into photography and cars/hotrods as well, so you can pretty much guess what we ended up talking about all night out there on the peers. 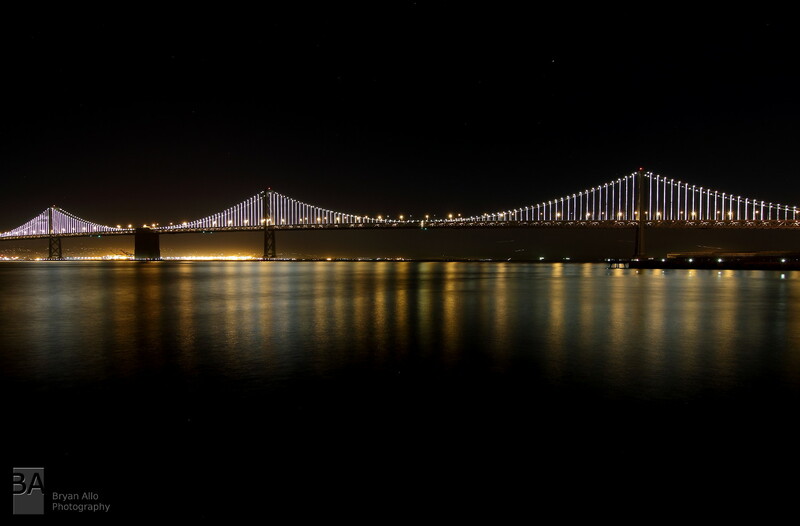 I took two time lapses of that view as well while shooting stills, HDR shots, panoramic shots and several 1080p video takes of the bay lights to capture the more subtle action that would otherwise be missed in the time lapse. I ended up shooting late and into the early morning when yet another pretty cool laid back guy by the name of James stopped by for a chit-chat. I got a lot of good tips on accessing some vantage points I’ve been wanting to shoot for a while now. Very nice guy. In all it was a great SF excursion, with lots of great people and a really relaxing time in a great city. I did time lapses of both scenes above and below as well. Will post those once I’m done processing all the frames.